The money tree does exist! And it could bring you a financial windfall! We now offer an original Good Luck Money Tree amulet that could bring you the financial windfall that you’ve been waiting for. Time is of essence. It’s time to take matters in to your own hands with this ancient symbol of luck and wealth. So, if you’ve been waiting for something to bring you luck and stimulate your earning power, wait no more. Your very own Money Tree is waiting to bear fruit and drop riches upon you. 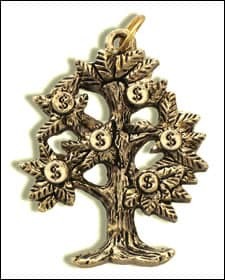 Coated in 14-karat gold good luck necklace, the Good Luck Money Tree could quickly become one of your most valued keepsakes. And, remember, the Money Tree is guaranteed to bring more money into your life or we’ll refund your money in full, up to one year after purchase. Your good luck charms such as The Money Tree make me feel a lot smarter, and the Lucky Number 7 charm makes me feel confident.